Last week I went for a dive at Fairlight. A little way inside Sydney Harbour, this is not a highly regarded dive site; it can be rough and murky and unrewarding. But occasionally the conditions align. With the wind and any swell from the north, a morning high tide and a bit of unknowable microbial alchemy, it becomes a place of unusual beauty, right there inside a working harbour. Fairlight colors are muted mauves and yellows. (An old post described the site on the clearest day I’ve seen.) Passenger ferries come through a few times each hour and the water shakes with their engines. You descend a small wall at the end of the shallows to enter the realm of the dive. On a rock at the bottom of the wall I saw three tiny flat white worms, or slugs. They were so small (perhaps 5 mm long or so) that I could barely see any details, but they all looked similar. A few days earlier I’d seen three nudibranchs of one species together on a rock at another site, and I suspected this was the same sort of arrangement, one that makes sense for hermaphrodites. I took a few photos but did not stay long, as this was just over the threshold and I wanted to go out into Fairlight’s sponge garden. 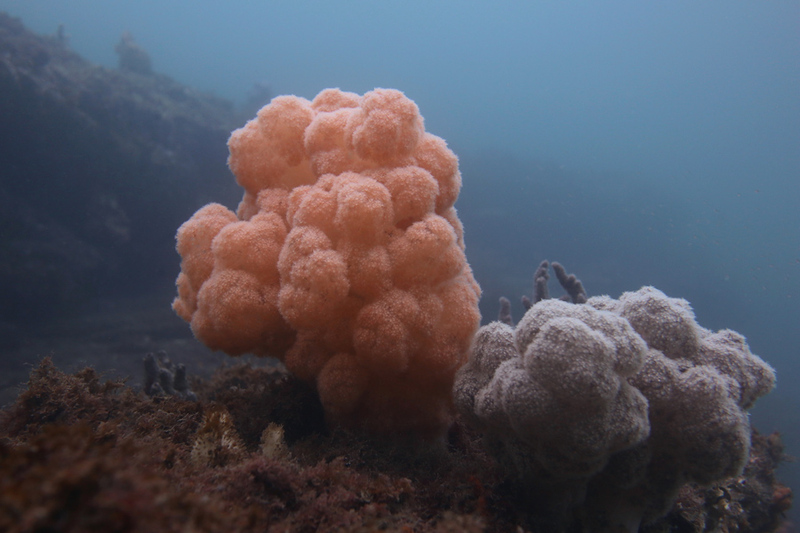 So I swam on looking for the lone soft coral on an underwater cliff I use as a landmark, the orange puff in the photo above. 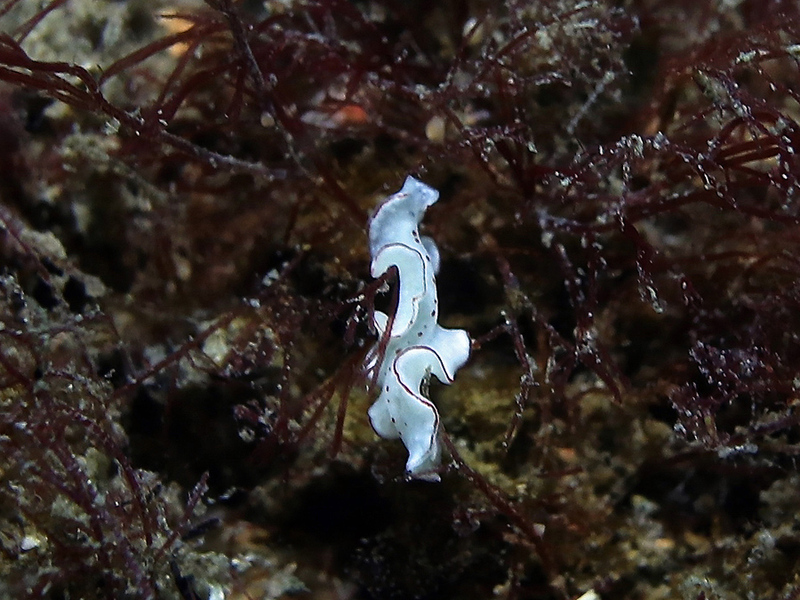 When I was out of the water and looking at photos back home, I saw that one white worm was indeed a nudibranch but one seemed not to be, though it had similar coloration, with a bright white body and fine red marks. With its ruffled edges it looked like a polyclad flatworm, a Platyhelminth rather than any sort of slug. Here is the flatworm, in the only decent photo I have (and after quite a lot of cleaning-up). Platyhelminths are in the same very big group of animals as nudibranchs and other molluscs (they are both Spiralia), but Platyhelminths have a much simpler body plan. * Another photo of this animal is here. Below is the nudibranch – Chromodoris hunterae. I wondered vaguely about the possibilty of cross-phylum mimicry as I started looking round the internet to work out the flatworm’s species – I’d not seen a white polyclad flatworm before. I soon found, via this site due to Wolfgang Seifarth, that polyclad flatworms are the most outrageous nudibranch mimics, especially of Chromodorids (which include the species above) and another group, the Phyllidiidae. They often match the patterns of particular species, as Seifarth’s site shows, not just the overall nudibranch look. Is the white flatworm a mimic? The patterning is not exact, with a yellow margin on the nudibranch and a red one on the flatworm. But the red spots are intriguing. 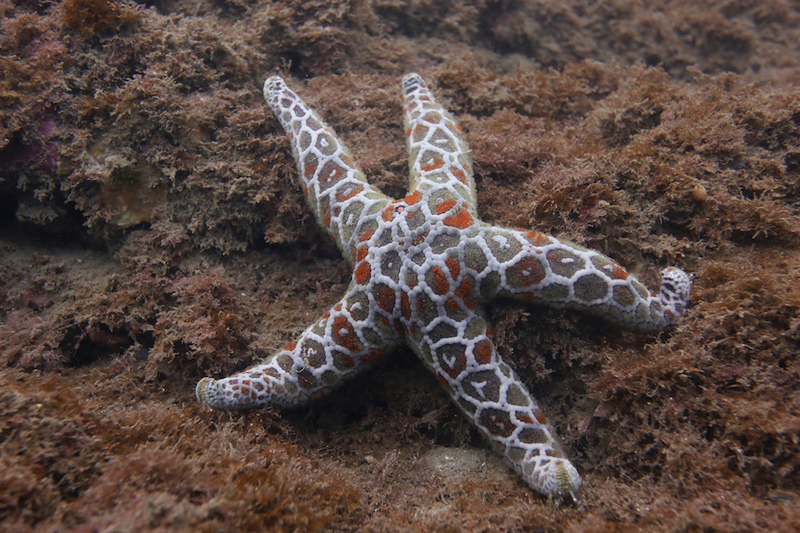 In addition, C. hunterae is a member of a group of red-spotted species that, as Bill Rudman conjectures, seem to form a Müllerian network among themselves. So the flatworm might be free-riding on (or joining in with) the whole complex, not just C. hunterae. The flatworm was also about a foot away, or less, from the nudibranch. That nudibranch species is not very common, and I’ve not seen the flatworm before. 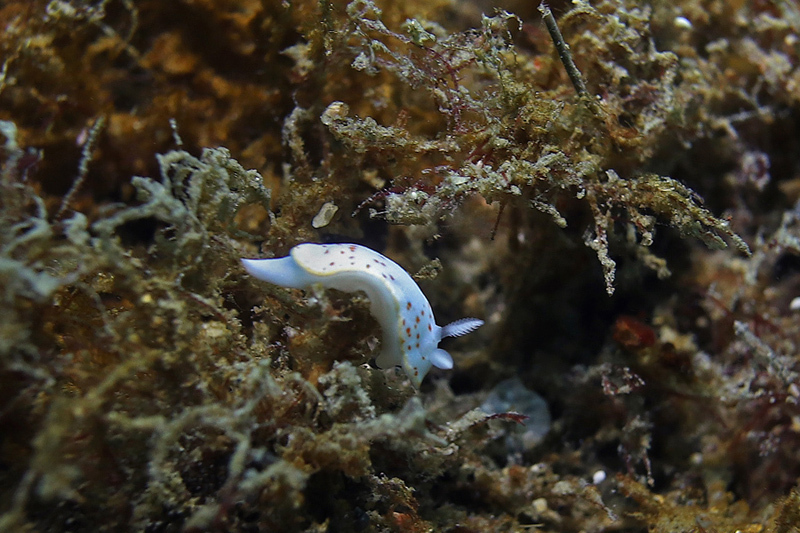 Nudibranchs can can track each other chemically quite well. 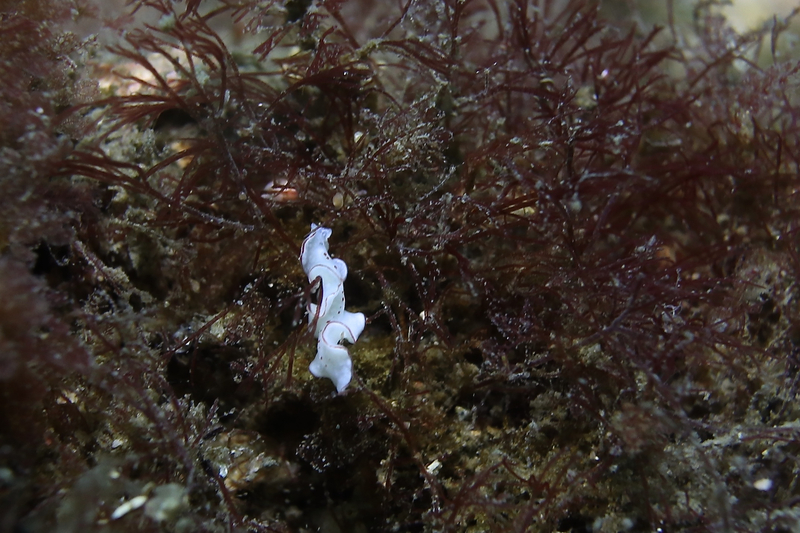 So I wonder if that flatworm was tracking the nudibranch, his+her model. I paid nothing like enough attention to the scene when I was there. Unknown to me, I may have been seeing a polyclad homage to nudibranch coloration. At present I am writing a follow-up to my book Other Minds. This book will cover a lot more animals, and I am currently working on a chapter about fish. As a result, I’ve been watching fish more closely, and pausing with them more often, than I ever have before. My stillness around them has been leading to some interesting small encounters. 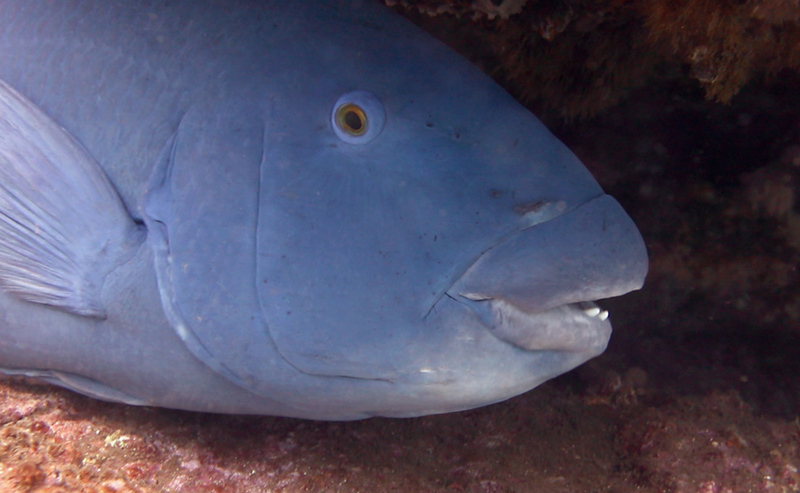 The Fairlight site has some massive Blue Gropers. They are curious and friendly fish, about a meter long. (They are not really “Groupers” but a kind of large wrasse: Achoerodus viridis). I was coming up from the flatworm dive and paused about five meters down, doing a ‘safety stop’ on the rock wall that is the boundary of the site. A Blue Groper swam right in next to me, working its way between ledges, and parked itself on the rock, just a few feet away, motionless. We watched each other for a few minutes. I took a bit of video of this enormous, trusting, friendly fish – a screenshot is below – as both of us paused, half way between deeps and shallows. I don’t seem to have any photos of the third white animal. Here, on my Instagram site, is a better photo of an individual at Nelson Bay that seems to be of the same species as the mimic. * “… a much simpler body plan.” They have no “through gut” – what goes in one end comes out the same end – and there’s no circulatory system. Transport of nutrients is by diffusion only, so the body must be flat. ** If “mimicry” must be an asymmetric relation – with one animal as model and one as mimic – then at least some Müllerian similarities might not be properly categorized as mimicry at all. There might be coevolution of a similar pattern in a symmetrical way, with neither side leading. But there could also be a gradation between Batesian and Müllerian phenomena; a mimic might be a bit distasteful, but not as much as the other species. This entry was posted in Color, Marine life and tagged mimicry, nudibranch, platyhelminth, polyclad. Bookmark the permalink. So happy that you’re writing another book – can’t wait to read it. Lovely photos, the worms and nudibranchs are like aquatic ballerinas. I saw a similar fish while snorkeling in Hawaii several years ago…they were friendly too (although, they were being fed treats by the tourists, so that may have contributed to the friendliness). I took some photos of them with a disposable underwater camera, thinking I was going to have some great shots – when I got the prints back, the photos looked like sketchy UFO sighting pictures.